Alexander Street Press (ASP) was founded in May 2000 and began publishing large-scale digital collections of exceptional quality in the humanities and the social sciences.1 It has built products that contain quality in copyright and previously unpublished materials, and developed a unique indexing system for all ASP databases, called Semantic Indexing.2 ASP’s first products began as letter and diary collections in American and women’s history, and later expanded into drama, performing arts, black history, Latin American literature, streaming music, and video. In 2006, Alexander Street Press began developing Critical Video Editions Series3 with its first streaming video collection, Theatre in Video. 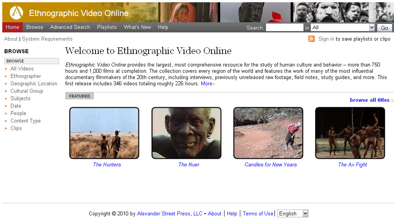 They have now expanded their repertoire with Ethnographic Video Online (EVO). EVO is a “visual encyclopedia of human behavior and culture, online in streaming video.” 4 It is unique in that the films have often been developed for teaching from the very beginning. The database is the most comprehensive resource for the study of human culture and behavior with more than 750 hours and 1,000 films expected at its completion.5 As of June 2010 the database has a total of 404 videos, totaling 270 hours.6 The collection is designed to cover every region of the world. ASP has always provided access to previously unpublished material and EVO continues this by featuring access to “hidden archive” collections and privately held footage made by working anthropologists and ethnographers in the field. This includes documentaries, edited field recordings, and interviews, all of which are accompanied by a synchronized transcript which can be turned on or off. The layout is clear and easy to navigate, and materials have been made cross-searchable along with the rest of the database content. EVO should be considered a core collection for use across the curriculum. It should prove to be invaluable for both scholars and students in the social sciences and other disciplines—anthropology, history, sociology, cultural studies, and film studies, just to name a few. EVO provides a way to analyze how visual anthropology has changed over time. It makes some of the earliest examples of ethnographic videos, such as Robert Gardner’s Dances of the Kwakiutl and Dead Birds7 available. The collection features interviews, raw footage, field notes, study guides, and transcripts of many of the most influential documentary filmmakers of the twentieth century. ASP updates EVO frequently and the user can access a list of newly added films through the “What’s New” link on the homepage tool bar. This database offers searchable transcripts (synchronized to video) powered by ASP’s Semantic Indexing, and it includes exclusive collaboration with Documentary Educational Resources.8 The films often will be accompanied by contemporary footage, photographs, and interviews with filmmakers, as well as retrospective considerations of the filmmakers’ work. The homepage is clean and clear with only two frames (see Figure 1). The large frame is a place for featured videos, and a brief welcome message that offers a quick explanation of what EVO can do. The second frame provides links to different areas of the resource. Those links are: All Videos, Ethnographer, Geographic Location, Cultural Group, Subjects, Date, People, Content Type, and Clips. The Browse Videos page is similar in appearance to the Clips, Browse Content Types, Browse Ethnographer, and Browse People pages. The “play” icon is the first button and the “add to playlist” icon is the second button. The A-Z list at the top of the table allows for the sorting of search results by a particular letter and the All Video link shows all available options. Once the user clicks on the title for a video or the play icon they will be presented with a new screen (see Figure 2). 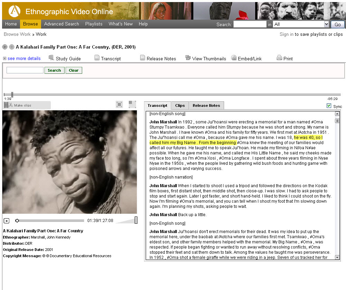 Using Adobe flash player, the video (seen in Figure 3) plays in a small frame that can be resized for full screen viewing, and to the right is a copy of the transcript, clips, and release notes when available. The transcript is synchronized with the video—allowing the user to follow along or alternately click any sentence within the transcript to clearly identify corresponding text with video. Above the video and the transcript there are icons for quick access to other tools. There is a “see more details” link that provides an abstract of the video, copyright information, cultural group, place (geographic location), director, language, original release date, participant, cultural place, producer, publication place, publisher, recording location, subtitle language, document type, duration, ethnographer, and general subject. If a study guide is available for this video, then the icon will be visible among the icons for View Thumbnails, Embed/Link, Release Notes, Transcript, and Print. The Make Clips link is located at the top of the video frame; which allows for the user to create a clip from a specific section of a video and then add notes to accompany that clip. The clip will also be given a unique static/permanent URL and it can be added to the MyPlaylist feature of EVO. In addition to the video lists, users can also browse by Ethnographer, Geographic Location, Cultural Group, Subjects, Date, People, Content Type, and Clips. Clicking on the title will take the user to the video player screen with synchronized transcripts. 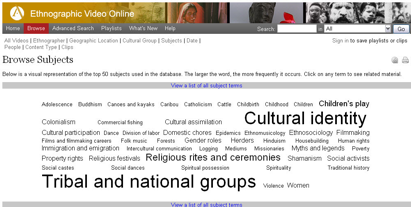 Clicking on Browse Subjects takes the user to a tag cloud (Figure 4) displaying frequently used terms. At the bottom of the tag cloud is a link to a list of all subject terms for a given video. Any column can be used to sort the results by clicking on the column heading. The user can view the individual locations within a geographic region by clicking on a continent to access a list of countries covered. The strength of EVO is its multiple options for searching. This resource allows Boolean operators in all fields. The user has access to both Quick and Advanced Search options. The Quick Search is available on all screens through the box located in the upper right corner of the resource. This search allows the user to do a very quick keyword search across the entire collection. The Quick Search also offers the ability to search a specific field using the drop down menu (All, People, Subject, Title, and Transcripts and Subtitles) next to the search box. The result will be returned in categories (see Figure 5). The Advanced Search function allows the user to input particular criteria to make search results more accurate. Any combination of one or more search fields will limit the search. The user can browse a term in all fields by selecting the “select terms” link (Figure 6). Searches for Titles or Series can be combined with other fields to look for specific terms within a known title. The user can search the Transcript and Subtitles field for any word spoken in any video. This field can be combined with the indexed fields for more powerful searches. 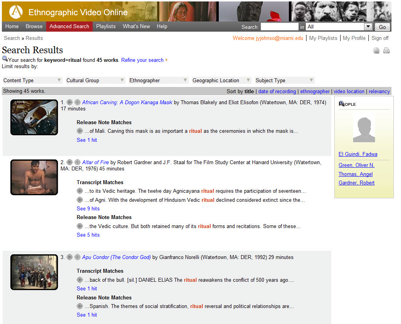 Users may select which Content type they want to retrieve; in addition, all videos where a person is indexed as an Ethnographer can be used with the Browse option. Selecting a range of dates to view content will narrow a Recording Dates search. Searches can also be run for a specific Publisher. Furthermore, the user can search for: the Original Release date; Geographic location; Language and Edition; All Subject; General Subject; Person Discussed; Cultural Groups; and Place Discussed. Word order and punctuation are not relevant and the user may enter more than one term in each search box. Other noteworthy EVO features are MyPlaylist, MyClips, and MyProfile. Through MyProfile users may upload a picture, change their display name, email information, give a short autobiography, and list citations of relevance that they have authored. Creating a profile is not a requirement to use this resource, but there are some advantages to having one, such as the ability to save and share playlists and clips. Each clip has its own unique URL that can then be used to embed in Web sites and course pages. 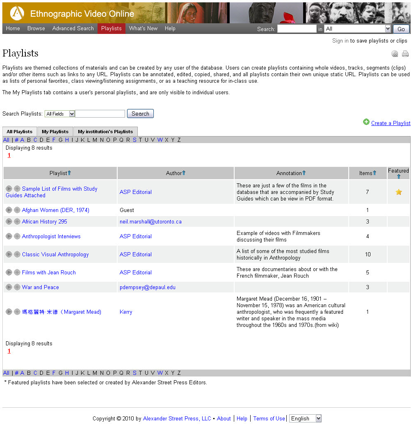 Playlists may be created and shared through MyPlaylist, and may contain a whole work, segments, and other items such as links (see Figure 7). It is also possible to annotate, edit, and copy the playlists. All playlists contain unique static URLs and users can set preferences for who may and may not view the playlist. User guides are available online through the Help section of EVO. These guides offer a brief introduction to the resource and its interface. Everything is covered from browsing the resource, searching, search tips, creating/sharing playlists, narrowing result sets, and navigating/understanding the video player screen with synchronized transcripts. Through the help guide, the user is presented with contact information for Alexander Street Press’ technical support team. Pricing is specified in a separate agreement letter and may be renegotiated periodically. ASP will provide Web access at the beginning of the term and that term can be extended. Authorized users are typically currently enrolled students, faculty, and staff, and IP authentication is available for academic member institutions. One of the most interesting features of this resource is the ability to create playlists of video clips or full videos. The user can embed videos into other resources and there are permanent links that allow material to be bookmarked. In addition, many of the films have study guides in the database; the anthropologists and field workers involved in the original film created each study guide. They were designed specifically as teaching guides for classroom use and intended to be used concurrently with the films. EVO is unique in that the films are often conceived for teaching from the beginning. The study guides may provide instructors with objectives, questions and activities, vocabulary, and other resources where available. These guides can be downloaded as zip files from the individual item record for the film and delivered in PDF format. Users will find the study guides, along with the transcripts, release notes, and thumbnails located just above the work-level record for the film. As the database continues to be populated, I would recommend that ASP develop robust biographical information and clarify which ethnographers have biographical information available through EVO. There is no clear way to determine if a person has accompanying biographies without clicking on the individual’s name. I would also recommend that the study guides be added to the Browse items list and that multiple file formats for downloading the study guides be made available. Ethnographic Video Online is developing into a valuable resource for those interested in the social sciences and humanities. The feature of synchronized transcripts along with playlists and clips makes it a highly desirable teaching tool. Faculty will find the streaming videos useful and the ability to create clips even more so. Instead of having to skip through various chapters on a DVD (or multiple DVDs), the ability to make clips means faculty will be able to quickly splice small segments from many different videos and then compile them all into one playlist. Through these features, EVO is able to provide users with access to classic ethnographic films and the ability to explore and analyze them in ways that have not been possible before. The Alexander Street Press welcomes suggestions for improvements and notice of factual errors. To report errors or to suggest improvements, email them to: Editor@astreetpress.com. I would like to thank the ANSS Bibliography Committee chair, Helen Clements, and Vanessa Rodriguez, University of Miami Information Specialist, for their support, patience, and kind editorial input.